Few games are as addictive as Tetris. Some have called it a communist plot, tracing our country's lack of productivity to the game's initial release. Whatever the political intentions may be, the game has become a national obsession. Nintendo even includes a Tetris cartridge with its portable Game Boy. Now its sequel, Welltris, has won the 1989 Best Action/Arcade award from the Software Publishers' Association. Created by the same Soviet programmer who designed Tetris, Alexey Pajitnov, Welltris takes the variously shaped blocks of Tetris and adds a three-dimensional perspective. As in Tetris, your goal is to maneuver the blocks as they fall so they form complete rows. After you fill in a row, it disappears, leaving you more room—and time—to carry out your strategy. Time is especially valuable because as the game progresses, the blocks fall faster. Welltris adds a three-dimensional perspective to the popular Tetris. That's where the similarity ends. In Welltris, your view is from the top of a well, looking down on a grid. You slide the blocks along any of the four walls as you guide the blocks into place at the bottom. You can eliminate rows vertically or horizontally or both at the same time. If any part of a block comes to rest on a wall, that wall is blocked for your next three moves. The game ends when any of the walls is stacked to the top or when all four walls are blocked. As a Tetris devotee (that's one step short of an addict), I've taken to Welltris in a big way. 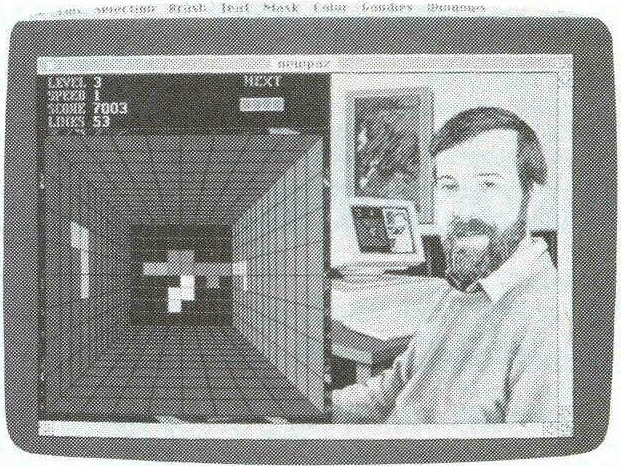 While Tetris is simplier and more elegant, Welltris's added complexity brings new layers of strategy: figuring out how to place the two-dimensional pieces into a three-dimensional grid, getting used to both vertical and horizontal scoring, and learning to use the well's four corners to create new shapes from old ones. I especially like to use the corner strategy. If you wrap a block across one of the four corners and drop it, the block splits in two. When either of the split pieces hits an obstruction, both it and the other piece freeze in place. The Mac version features excellent Russian folk music to put you in the glasnost mood (you can also turn off the music), separate black-and-white and color versions in the same package (unfortunately, there's no desk accessory version, as there is with Tetris), and easy-to-use pull-down menus for the various game options. If you're one of the unsuspecting millions who fell in love with Tetris, you owe it to yourself to try Welltris. It's more than just a quickie sequel—it's an authentic chip off the old block.